If you go to a rally while it’s raining, the issue is probably really important to you. 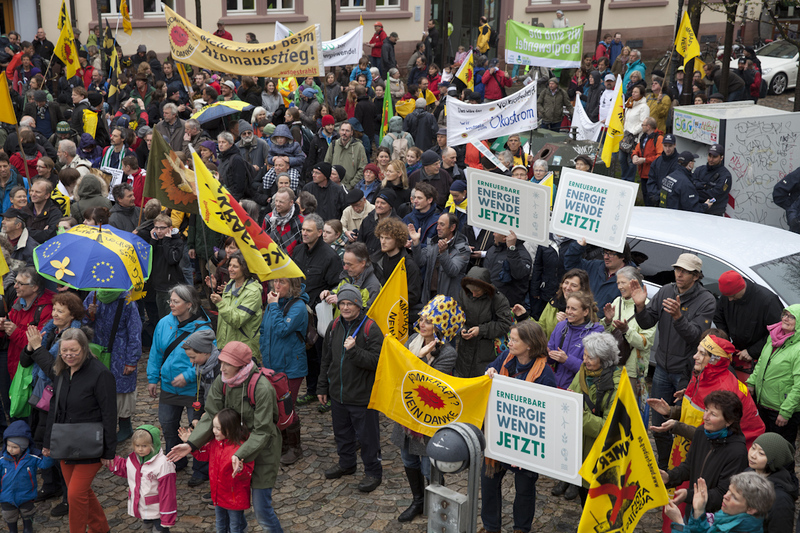 Between 1000 and 3000 people (as always the numbers vary) took part in the rally for the energy transition, which formed in front of the municipal theatre of Freiburg and led through the city centre to a square called Augustinerplatz. „Stop coal and nuclear, we want wind and solar power“ the protesters shouted and carried their rain-soaked banners past the shops and the tramway in the city centre. 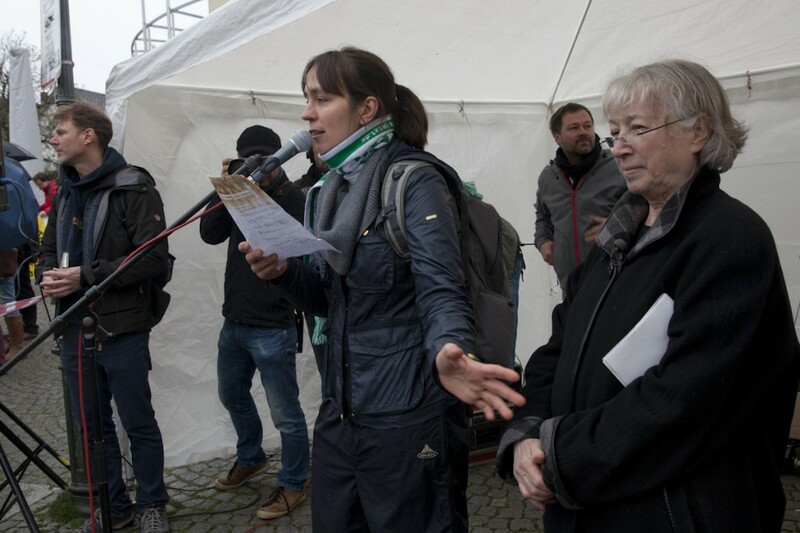 The speakers of the rally Ursula Sladek (EWS Schönau), Prof. Eike Weber (Fraunhofer ISE) and Dieter Salomon (Mayor of Freiburg) carried the lead banner which showed the motto of the rally „Speed up the energy transition, don’t slow it down“. In her speech Ursula Sladek explained how the new version of the Renewable Energy Law (EEG), as planned by the government, will threaten the participation of citizens in the energy transition, although the success of the energy transition has mainly been brought forward by citizens. Every other kilowatt hour from renewable sources comes from plants, that citizens either built themselves or together in cooperatives. The recent plans of the federal government threaten projects that are currently in the planning phase and for which citizens have invested a lot of money and committment. A major issue of the rally was the rising electricity tariff and the renewable energy law (EEG) contribution. „They make us believe that power from coal and nuclear energy is cheaper than renewable energy. If you would make the external costs of these technologies as transparent on people’s electricity bills as the costs of the renewable energy, everybody could see already today that renewable energy already has a competitive price“, Ursula Sladek explained. She pointed out that the reneable energy law contribution and with it the price for electricity doesn’t go up because more renewable energy is produced, but the EEG contribution rises because large industries don’t have to pay the contribution and the price for electricity at the electricity market goes down because of the larger supply of wind and solar power. „If the new version of the EEG is implemented as planed, all existing coal plants, that are distroying the climate, will still be in use in 2030. None of them will be phased out. 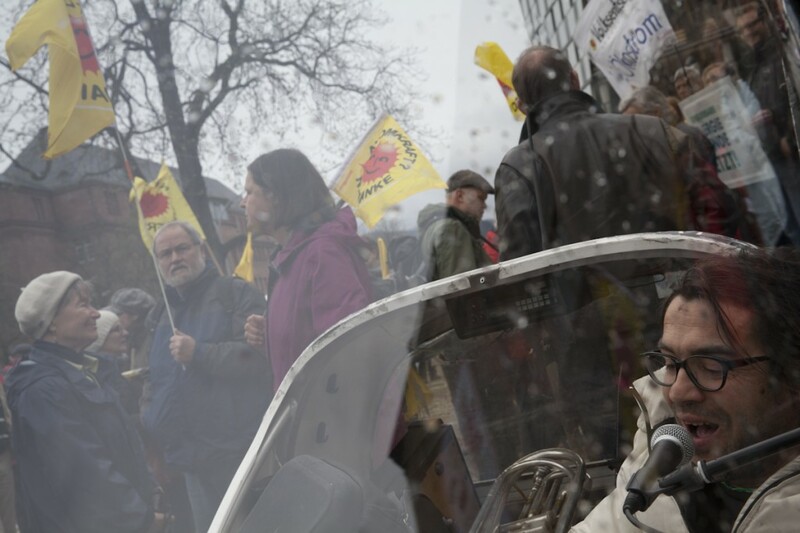 The nuclear phaseout will also be in question again“, Ursula Sladek adds and asks whether the government really wants the energy transition or whether the so-called „electricity tariff brake“ is actually meant to make the energy transition fail. Mayor Dieter Salomon addressed the success story of the energy transition in Germany and especially in Freiburg: „The term „Energiewende“ (energy transition) originates from Freiburg. The „Freiburger Ökoinstitut“ already demanded the energy transition in a book in 1980. The government’s energy transition now is about 30 years late.“ Looking back on many years and decades of protests he pointed out, that rallies like this one contributed to the development of renewable energy and are still necessary to show the government, how important the Renewable Energy Law is, which has already been successfully copied in 50 countries around the world. Checking the news I saw that 30 000 people all over Germany took part in rallies for the energy transition on this day.